A group of us in the South Australian Permaculture movement are endeavouring to create rituals which are appropriate to our locality. To celebrate Summer Solstice, we gathered just before dawn on a hill overlooking the city, and after a simple ceremony to celebrate our love of the Earth, we watched the sun rise, and then shared breakfast before dispersing to take up our usual daily round. Now it is winter - halfway round the Wheel. The drought has broken, though the rains have been late and sparse. But the hills are green and misty, and the river is running freely once more. We see our New Zealand neighbours battling with early blizzards, and Aussie skiers rejoicing in the early winter in the Snowy Mountains, ensuring good snow for the forthcoming school holidays. At the Solstice we intend meeting on the beach to watch the sun setting. After reverencing the bounty of the Earth and the Sea, a small group has worked hard to arrange a Labyrinth Walk in a nearby church hall. and the rhythms of the Earth slow and deep. Like most ancient symbols, it is based on one of Nature's own most frequently used patterns, which in Permaculture we use as a template in our own designs. 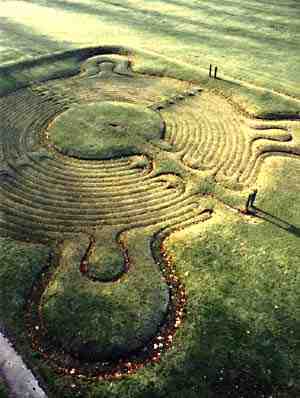 To walk the Labyrinth will greatly enhance our understanding of Nature's patterns. To our Northern cousins we send loving greetings - we will hold you in our hearts as we make our symbolic journey. May your Summer Solstice be joyful, and it's powerful energy join with ours in creating a co-operative and harmonious spirit for the healing of the Nations and the Earth.